North Korea has reopened a hotline to South Korea, almost two years after it was disabled on the orders of leader Kim Jong-un. South Korea confirmed it had received a call from the North at 15:30 local time (06:30 GMT) on Wednesday. The North Korean leader had earlier said he was open to dialogue with Seoul and to sending a team to the Winter Olympics in the South next month. The two nations have not held high-level talks since December 2015. North Korea cut off the communications channel shortly afterwards, refusing to answer calls, according to officials in the South. 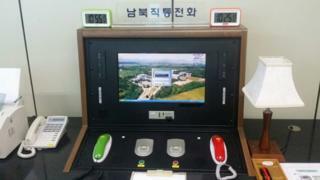 A North Korean official announced the hotline's reopening in a televised statement. Instead of a senior newscaster, the chairman of the Committee for the Peaceful Reunification of the Fatherland, Ri Son-gwon, made the statement, saying he was speaking "upon authorisation of Kim Jong-un". The initial call was brief as checks are still being carried out on the line, according to South Korean officials. North Korea said the aim would be for the two nations to discuss the practical issues around sending a North Korean delegation to the Winter Games in Pyeongchang. Will North Korea compete at the Winter Olympics? How has the South responded? The press secretary for South Korea's President Moon Jae-in said the restoration of this communications channel was "very significant". "It creates an environment where communication will be possible at all times," he said. In the press, there was scepticism. "Kim's New Year's address is a highly calculated move to fuel internal division in South Korea," said daily newspaper JoongAng Ilbo. "Pyongyang may have decided on its peace offensive to buy time until the completion of its nuclear weapons programme." Hankyoreh newspaper also voiced caution: "Kim has not budged an inch from his previous reckless and hard-line stance on the development of nuclear weapons and missiles." But the "surprising New Year's address could open the door to peace", it added. Where is the physical line? According to the South Korean Unification Ministry, there are a total of 33 direct lines that North and South Korea once used to communicate with each other. This particular phone line, established in 1971, is based in Panmunjom. The border village, in the heavily guarded demilitarised zone (DMZ), is where the Koreas have historically held talks. Why have the Olympics become so important? In a New Year's Day speech, Mr Kim spoke of lowering tensions and of melting "frozen North-South relations". He said attending the Games would be "a good opportunity to show unity of the people" in North Korea. South Korea had already indicated that the North's participation in the Games would be welcomed. Seoul offered high-level talks in response, with President Moon Jae-in calling it a "groundbreaking chance" to improve relations. 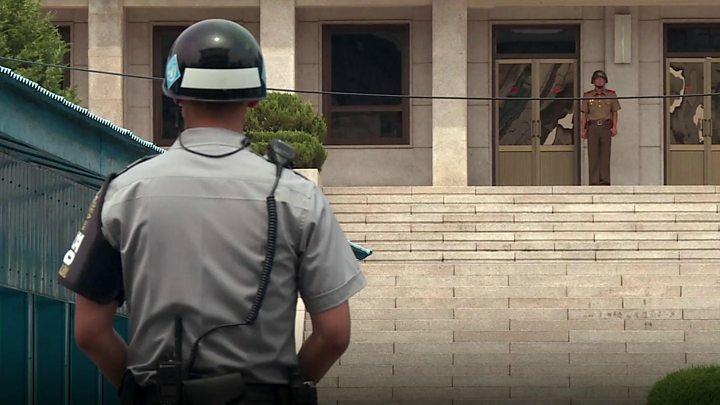 It is not yet clear whether North Korea will accept that offer, but the opening of the hotline will allow for preliminary discussions to be held. When did the line stop being used? North Korea cut off communications on the hotline in 2016, following a row over the Kaesong industrial complex. The complex was a joint economic venture between the two Koreas, but the South suspended the project in response to a nuclear weapons test by the North. Have the two already held secret meetings? In China in late December, according to North Korean leadership specialist Michael Madden. A North Korean vice-minister of athletics was sent to interact with his South Korean counterparts, who may or may not have been acting on President Moon's instructions, he says, adding that this might ease the higher-level talks. Will nuclear testing be discussed? North Korea has come under increasing international pressure in the past year over its nuclear weapons programme. President Moon said the North's continuing tests would be the backdrop to any new discussions about the Olympics. What role might the US play? At the same time as offering an apparent olive branch to the South, Mr Kim used his speech to repeat threats against the US, saying a nuclear launch button was always on his table. US state department spokesman Heather Nauert said that Mr Kim's latest move "may be trying to drive a wedge of some sort between the two nations - between our nation and the Republic of Korea [South Korea]". Washington has encouraged all countries to isolate North Korea. The South says it has discussed its latest steps with the US. Does Donald Trump have a nuclear button? How would the US order a nuclear strike? Meanwhile, Mr Trump remains outspoken in his tweets. On Tuesday night, the US president boasted that his nuclear button was "much bigger" and "more powerful" than the North Korean leader's. Chinese foreign ministry spokesman Geng Shuang said the North and South should seize the Olympics as an opportunity to ease their relationship. "All relevant sides should grab hold of this positive trend in the Korean peninsula and move in the same direction," Mr Geng told a daily news briefing in Beijing, according to Reuters news agency. Will North Korea compete in Winter Olympics?